It is not surprising that the government of the third largest Catholic country in the world would declare the days of the Pope’s visit “Special non-working days” in the national capital. All non-essential government activities (including the national archives) are closed, all school and university classes have been cancelled, and many businesses will not open their doors. The enforced holiday is supposed to clear usually congested roads of cars and jeepneys so the Pope and pilgrims move more easily from A to B. For the outsider, Pope Francis’ visit to the Philippines this week provides interesting insight into the present social, political, and cultural dynamics of this country. In addition to displaying the committed Catholicism of many Filipinos (over 5 million are expected to attend the public papal mass on Sunday), the papal visit has shed light on some of the tensions that exist between the country’s ruling elite and everyone else. Dante Hipolito’s painting of the Pope’s visit, courtesy of The Adobo Chronicles. This painting by Filipino artist Dante Hipolito went viral on facebook and twitter this week, days ahead of the Pope’s arrival in Manila. 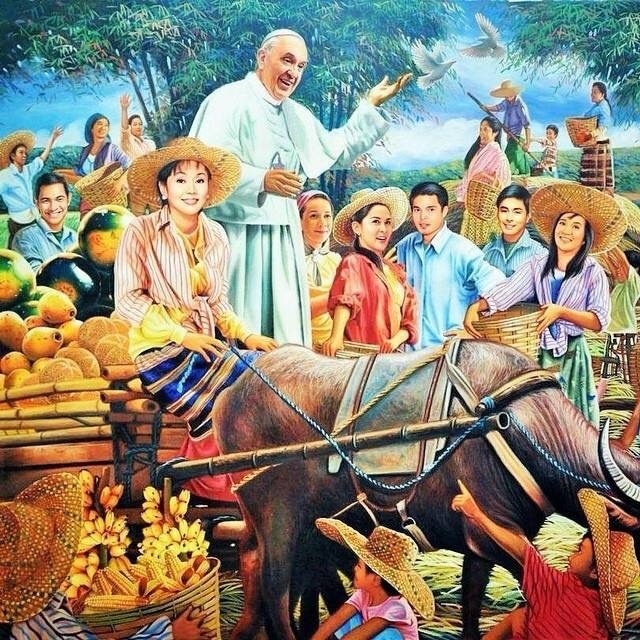 Pope Francis is depicted riding a Carabao-driven cart driven by Vilma Santos, a famous Filipina soapie-star and current Governor of the Batangas Province. Hipolito’s painting includes the hyper-real likenesses of several other famous Filipino politicians and celebrities who smile and wave at the Holy Father, including Senator Grace Poe, Marian Rivera (Film star and singer), Kris Aquino (talk-show host and sister of President Aquino), Coco Martin (actor), and Gary Valenciano (singer). The artwork has aroused controversy. Journalists have attacked the portrayal of all of these rich and fabulous Filipinos as farm workers, who are counted among the poorest people in the Philippines. Michael Beltran, the chair of the artists group, Karatula Kabataang Artista para sa Tunay na Kalayaan, said that “The painting… shows nothing about the submerged reality of the nation’s agricultural workers,” and it failed to reflect “the turmoil that many Filipinos experience in their social and economic lives.” Beltran also pointed to the irony of Kris Aquino dressed as a farm worker when she has interests in Hacienda Luisita, the sugar plantation where seven striking farm workers were massacred a decade ago. But some cultural commentators suggest that the artwork is subversive satire: it mocks the celebrities posed with the Pope. Instead of uniting the country under the banner of the cross, the papal visit has exposed the divide between politicians, elites, and the Filipino people.